A dining area, as well as an informal office nook, sit on either end of the kitchen. Obstructed by the “U” configuration, the room felt divided and broken up. The new design unified the different areas by adding a second opening to the butler’s pantry and eliminating one leg of the “U”. The dining area is adjacent to the kitchen but feels like a distinct space, nestled into a bay of windows looking out to the ocean. 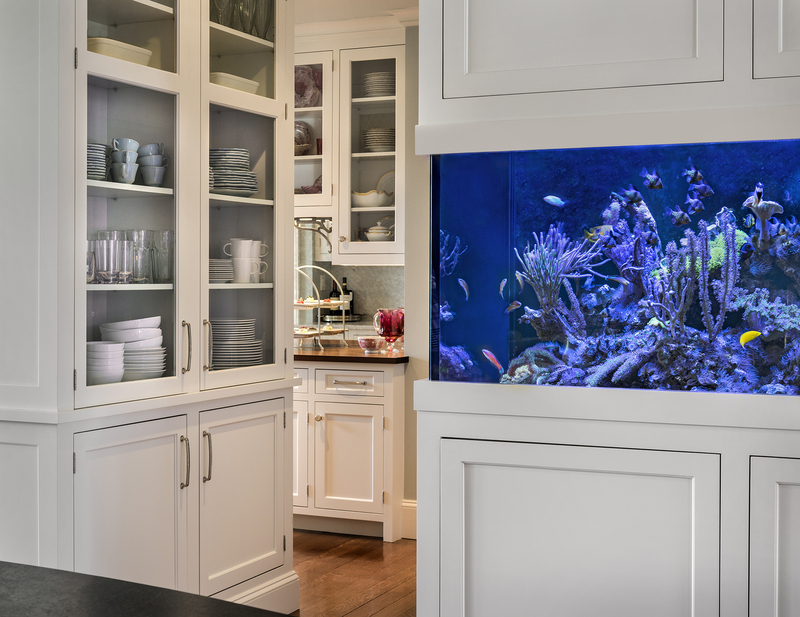 The most stunning and memorable feature of the new kitchen is its custom aquarium. 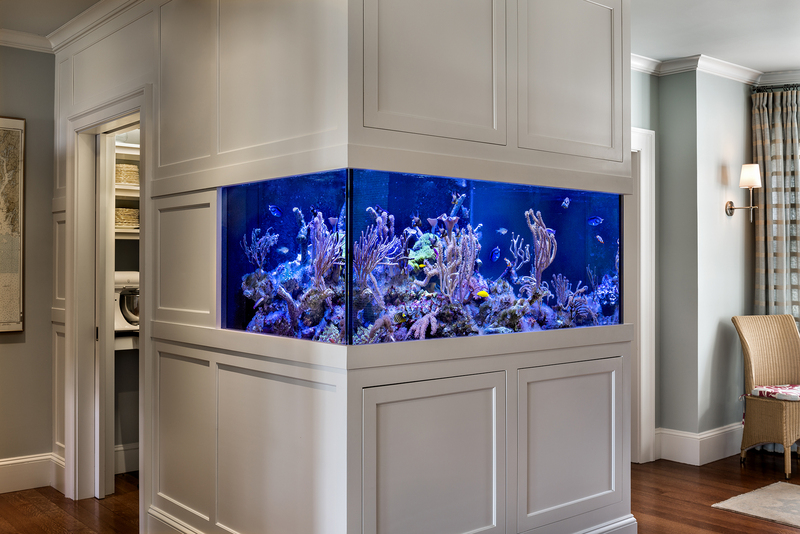 The homeowner explains that “the aquarium was a special request from my husband, who is an avid mariner, scuba diver, and lover of sea life. He always wanted an aquarium, but we could never find the right place for it.” A major task was finding the perfect location… something that didn’t feel intrusive or out of place. The chosen spot was previously occupied by a large antique wood stove that received little use. Opening up that corner also created direct circulation into the pantry and bar spaces beyond. The objectives for the aquarium were complicated and multifaceted: it needed “to house seahorses, which require a specific habitat; it needed to sustain live coral, which meant a rather complex filtering system, ideally hidden from sight”; and finally, it needed to blend in as seamlessly with the cabinetry as possible. Knickerbocker Group, in conjunction with New England Aquarium Services of Biddeford, worked together to accomplish all of these goals. The tank sits within custom cabinetry, which is comprised of panels above and below that open to reveal the mechanics and filtering system. Also, the lighting within the tank changes throughout the day to mimic the characteristics of a true underwater environment. 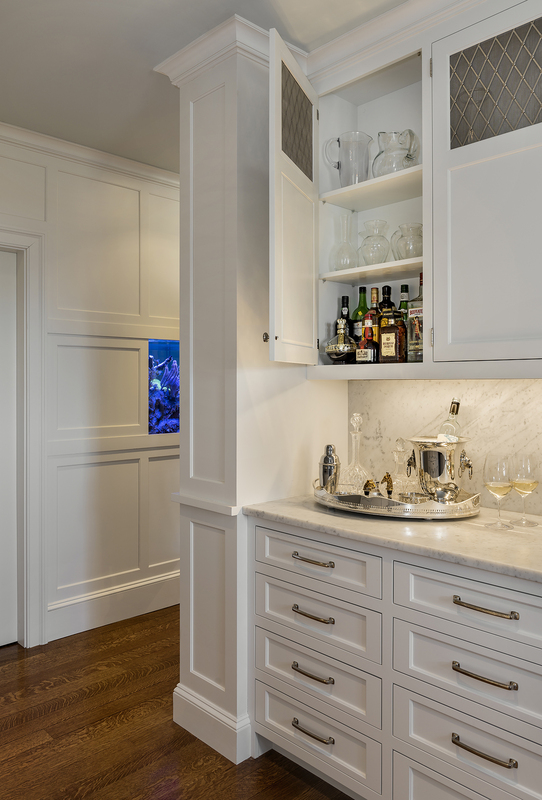 On one side of the aquarium, a new entry leads to a pass-through bar, light-filled pantry, and secondary sink area. These spaces are slightly offset from the kitchen, but the flow of movement into them is seamless. The homeowner describes her taste as “varied” and explains, “I love historic architecture but also grew up in modern houses with modern art; I wanted some references to history but not to be constrained if I happen to see a modern element I liked.” This concept is evident in the lighting that the client selected with the help of her long-time friend and interior designer, Katy Gannon-Janelle who assisted with design decisions throughout the process. 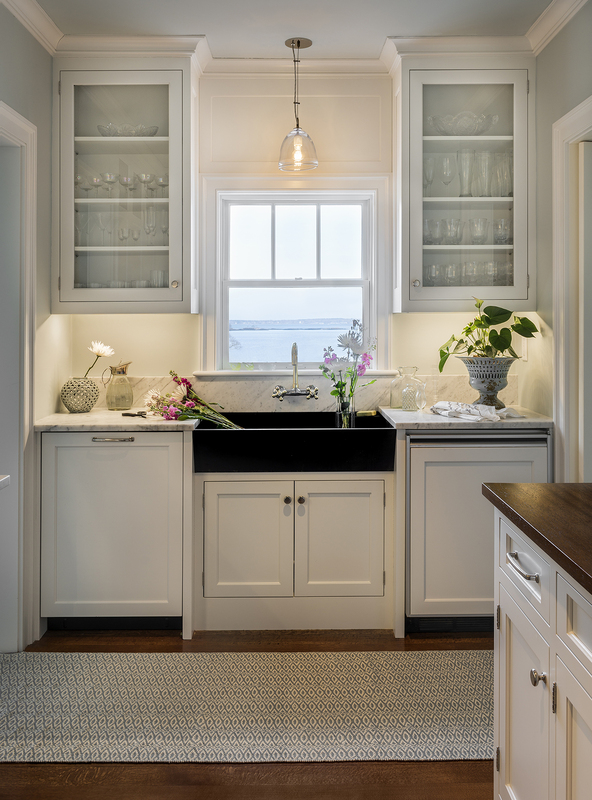 The fixtures act as a contemporary juxtaposition to some of the home’s historic elements, such as the original slate pantry sink and the spectacular oval pattern leaded glass windows at the desk nook. 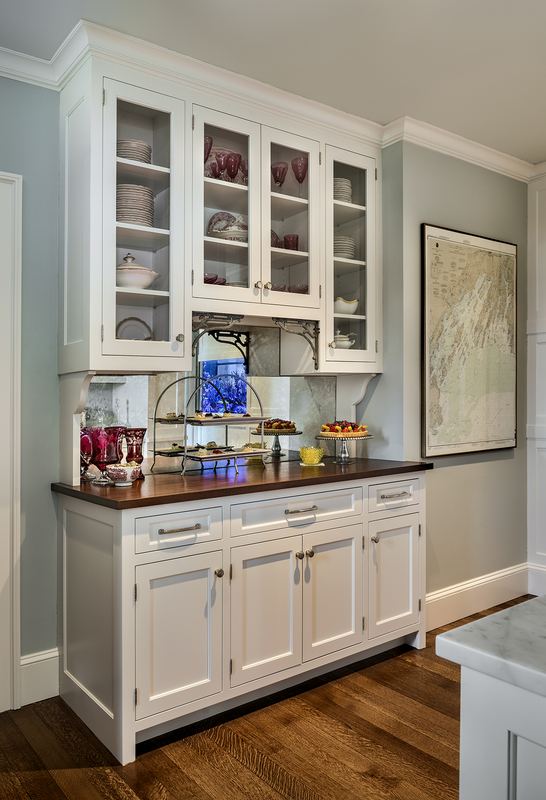 Other touches of the past can be seen in the antique mirrored glass that acts as a backsplash, and the restored metal brackets repurposed as a decorative element in the butler’s pantry. The homeowners desired a kitchen that maximized function and convenience while also evoking a unique and well-thought-through aesthetic. They had a few guiding principles going into the design process, one of them being that they “wanted a new looking kitchen which had references to the era of the original house.” This was carefully considered when specifying certain elements, such as the main kitchen sink. 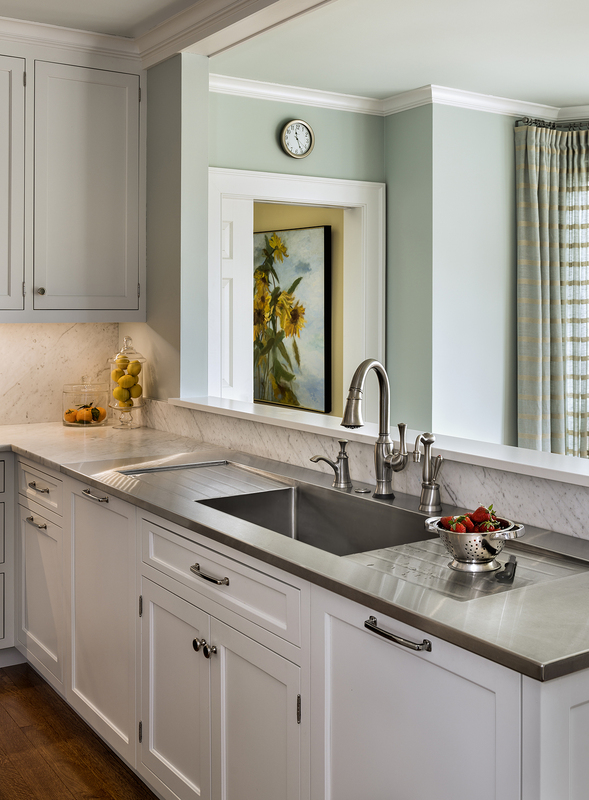 The client states that “the sink was something I wanted to be reminiscent of one that I had fond memories of from my grandmother’s house…I always admire the German silver sinks in historic homes.” Needing a sink that would wear well in a heavy use environment, Knickerbocker Group found a modern solution. The result was the creation of a custom, stainless steel, single-basin, double-drain board sink constructed by Specialty Stainless of Buffalo, New York. It achieved the look the homeowners wanted, but is more durable than the original inspiration. The statement piece lays flush with the marble slab countertop. One of the other guiding principles that the homeowners wanted to adhere to throughout the process was to source as many products from Maine businesses as possible. “The stove was an important selection because it is so large and central to the space. This was an opportunity to go ‘back in time’ as far as look, but get a modern appliance.” Having considered some French ranges, the clients ultimately settled on the Italian made Ilve because it was sold in Maine. Another memorable feature of this space is the large format artwork, which stands in contrast to the antique look of the stove. The piece, by Jane Waterous and entitled “The Code-Peace”, is a painted Morse code translation of John F. Kennedy’s 1963 commencement speech, and was bought on a whim the summer after the renovation. 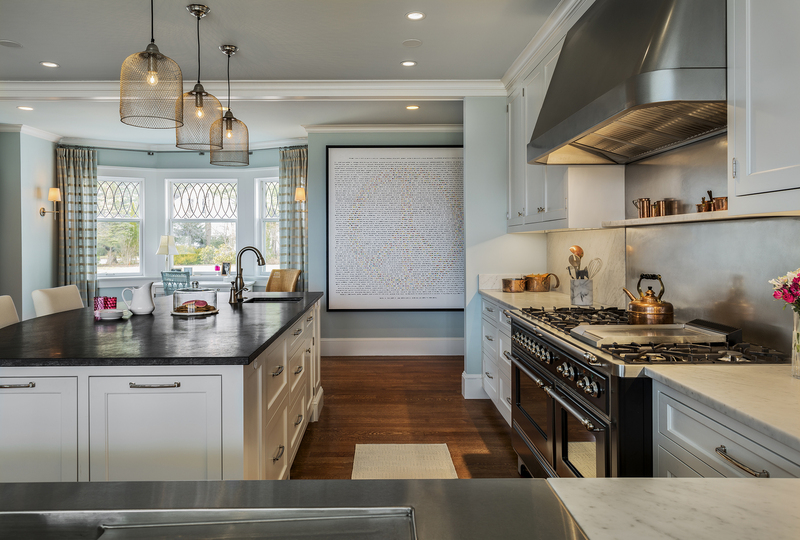 Upon closer examination, the colors within the painting subtly form a peace sign…a symbol which is also reflective of the peace of mind the homeowners have finally achieved in their new kitchen.